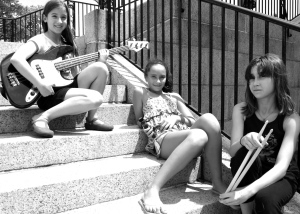 Our inaugural LV Girls Rock Camp was a huge success. Nineteen girls, ages 10-17, spent the week with us at Liberty High School in Bethlehem, PA. They learned how to play an instrument, formed a band and wrote an original song together in just five days. 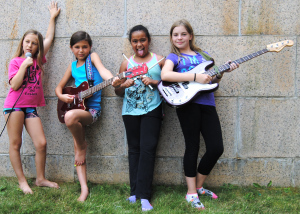 The first day of camp, Monday July 7th, featured a songwriting workshop led by Brittany Ann Tranbaugh, a presentation called Women Who Rock by Roberta Meek and a performance from Noun. The following day was a blast. 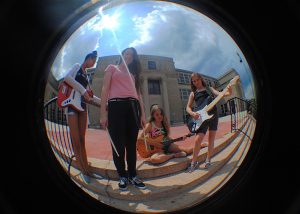 Katie Trinisewski taught the girls how to make zines, Caitlin Schultheis helped each band create their own logo and Slingshot Dakota played for us! On Wednesday, Tina Thomas taught a yoga class, Kai Corniel led a workshop on stage presence and Moonstruck, our founders, performed. Thursday featured a discussion about body positivity, Beauty is for Every Body, led by Jaime K., a screen printing workshop where the girls got to create band merch with materials donated by Lehigh Valley Apparel Creations and a lovely performance from Brittany Ann & Carolyn Thorn. The last day of camp was bittersweet. The girls decorated flyers, heard about what it’s like to be in the music industry from Julie Kunkel & Kelly Crane and saw a performance from Heavy Temple. Throughout the week were other fun activities including a scream circle, countless dance parties, the reading of The Radical Self Love Manifesto and SO MUCH MORE! Our program concluded with our showcase on Saturday July 12th at Diamond Theatre. Shine Like Diamonds featured five bands each playing their original song in front of their family, friends and future fans. The performances were spectacular!!! Confidence exuded from each girl. Thank you to Kiera McGowan for being an awesome MC! The night ended with the closing of our silent auction, organized by Eleni Burd, which featured items from Mates of State, Chvrches and Teegan & Sara. watch Around The World perform here! watch The Punk Rock Fairies perform here! watch The Red Queens perform here! watch Soul Survivors perform here! watch Triple R perform Magical Things here!